IASB members listen to Russ Wiesley speak. Two Iowa Association of School Board leaders say the organization has “weathered” a “fiasco” over the past nine months, emerging as a “leaner, stronger and more effective” group. About a year ago problems began to surface and the group’s executive director eventually was fired after she allegedly raised her own pay significantly. Early this year legislators held statehouse hearings, questioning whether tax dollars had been misspent by the association. 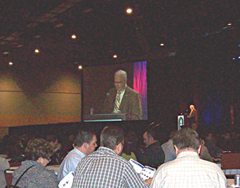 This week over a thousand school board members and administrators from around the state are in Des Moines for the annual meeting of the Iowa Association of School Boards. Veronica Stalker, the group’s interim executive director, gave a convention speech that was a bit of a status report. Stalker took over as the association’s chief executive in early May. “I could not stand back and watch a fine, respected organization be shot down by external forces,” Stalker said, to scattered applause from the crowd. Stalker defended the board that oversees the organization — a panel made of up school board members from around the state. Stalker pointed out that of the five board seats up for election this year, three incumbents have no challenger. There’s someone challenging an incumbent in another district and, in the fifth district, no one has yet stepped forward to run for that slot. Stalker also addressed complaints about the group’s shift to being required to open its meetings and records to the public. A law that became effective January 1 made the Iowa Association of School Boards subject to the state’s so-called “Sunshine” Law. Russ Wiesley, a Waukee school board member, is president of the board of directors for the Iowa Association of School Boards. He briefly addressed the organization’s members this morning.